Asus ZenBook UX306 Review: Better Than UX305: Ultrabooks are now become widely accepted among all PC manufactures as they are thin, light, sleek and powerful than expected. Many companies like Apple, Acer, Asus, Razor and more are really put their effort to bring out the best out of it. Asus last year Ultrabook ZenBook UX 305 which is very impressive Notebook from Asus. There are some problem last year ZenBook UX 305 which is resolved in this new ZenBook UX 306. Asus ZenBook design is looks most appealing Ultrabook design with body made up of Aluminium with brushed layout on the top which really takes you eye. As you open up the note-book you will feel some elevation on the extreme end of the display which is supported by metal bars as earlier model has only metal to which may get scratch into it. Keyboard and Trackpad is placed perfectly on to the which meant for comfortable typing and reading experience. On the side device has One USB Type A port 3.5mm Headphone jack And Micro SD card slot. Other side device has a USB Type C Port, Micro HDMI Port and Power port. As these ports are very well placed and utilizes each space. On the front side device include a HD camera which is nice for calling from Skype and other services. On the spec sheet this device account dimension of 324 x 226 x 13.9 mm (WxDxH) and weight around 1.19Kg along side with battery. As weight of the device is optimum but can be less as it is a ultrabook. Display of this device is gorgeous 2K display with Asus Display technology which make this screen more vivid and light in looks. ZenBook can cover over 72% of Color GAMUT range which mens more wide color GAMUT and High quality of Wide Viewing Angles. Colors looks more life-like effect with Asus technology which include eye care and Vivid Mode as this add more accurate color for whatever content you are watching. Color correction, contrast, detailing are just perfect. While the display of the device is 13.3″ with option of F-HD and Q-HD displays. While we are reviewing 2K version has 3200×1800 resolution with 276ppi which means intensity are just awesome. Viewing angle of the device is also good with 178degree of view and color are accurate from all sides. Ultrabook’s are always having low powered processor as it help the device to consume less power and more performance but Asus ZenBook UX 306 don’t have these limitation as it feature Intel’s 6th Gen Skylake Core i7 processor with 16GB of RAM which make this device more powerful and snappier than Core m7 which usually found in many Ultrabooks. Storage option include 256GB to 512 SATA 3 SSD which is optimal for usage. Our review product has Core i7 6500U processor Dual-core 2.50 GHz model with 16GB of RAM and 512GB SSD. While using device don’t make you feel using a low powered device using Office Apps which run snappier and nice. Video editing of 4K with Corel Video Studio runs fast and without any issue. Device also include Intel’s Integrated Graphic card HD 520 which not handle very hard-core game but manages to keep its frame nice. But playing Overwatch in very low graphics option and resolution mange upto 60FPS of gaming. Option of this device start from Processor option of Core i5 and i7 which sixth gen Intel processor which RAM option include 8GB or 16GB while Storage has 256GB upto 512GB SSD’s. Best optimum option in our choice is Core i5 model with 8GB of RAM and 256GB of SSD. Connectivity option device include Wi-FI 802.11ac and Bluetooth v4.2 while other purpose of Syncing include Type-C and USB 3.0 ports. For playing content device include Micro HDMI cable which helps a lot in magnifying your content on large-scale. Asus ZenBook UX 306 has pre-installed Windows 10 Pro which is best OS from Microsoft so far optimization of the OS with performance is awesome. Multitasking, Using new desktop or many feature of Windows 10 works here but only Windows Hello is not supported yet. Display of the device is not touch based so sorry for Windows 10 Anniversary update because Pen Paper interface will not able to run. Speaker on this device is not much appealing so while speaker are 2W Stereo Speakers which enough to fill your room spaces. Audio quality of the device good but not awesome some pitch of notes are bit too high and some are low. But overall its good and also this speaker is nice and clear in audio. 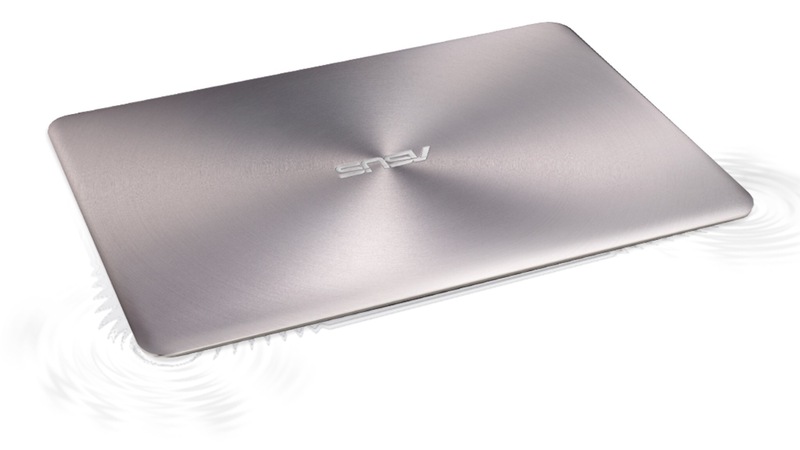 For Heating solution Asus uses frost cooling technology which cools Notebook lower part which means track-pad and palm rest position which upper side of keyboard is hot but manageable. Watching movies, Playing games left this Notebook remains cool but more complex processing power make it hot. Keyboard of Asus ZenBook is Scissor mechanism normally uses in all notebook which is optimum for longer typing experience and missing keys are not happens. Keyboard of the device gets nice improvement with backlit support which help from dark. While Trackpad has received nice improvement from last year as it has become more snappier and nice. While gesture are just nice and amazing. Asus ZenBook gives large disappointment by giving only about 7 hour of usage as company said to give about 12 hour which hardly able to achieve with device. Playing games, Watching Youtube content and chrome. But things are little better if using it under lower brightness. Asus ZenBook 306UX is nice Ultrabook with very nice spec into it. With very light and thin design. But battery of the device it pretty low as specified so this section must be improved. Using device for any purpose like office work, collage life or student this notebook never makes you regret. While price of this device start from $ for Core i5 Processor model while Core i7 model with 512GB SSD cost about $999. Why are you testing the battery life with Chrome? It’s memory and power hungry.. With Firefox or Edge I am pretty sure it will stay on for 2-3 hours more.. My N550 drains battery in 2 hours with chrome, in 3.5-4.0 hours with them..
OK i i will surely try on suggested browser too.